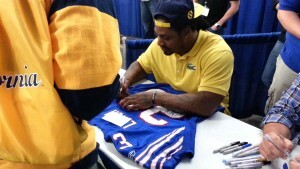 Seattle Seahawks star running back Marshawn Lynch signed autographs at Champs Sports in Bellevue Square in Seattle, Washington on Friday November 15. Fans who went to the event had to purchase the merchandise that they wanted signed on site and no outside merchandise was allowed into the store. Lynch was at the venue from 7 p.m. to 8 p.m., and there was a great turnout to see the man behind the Beast Mode and get to take home a souvenir with his name on it. Due to the high volume of people going to the signing, only one item was allowed per person. The five-time Pro Bowl player was in Seattle’s Bellevue Square earlier this month to sign autographs for fans, and it was a very successful turnout. If your company is interested in finding out availability and booking fees for a professional football player like Marshawn Lynch or other sports celebrities for an Autograph Signing, Product Promotion, Guest Appearance, or Football Camp, call us at 1-888-246-7141.